The price is for the cotton candy machine itself. It is a full size machine. For an additional cost, we sell the cotton candy sugar floss. We also sell the cotton candy cones and cotton candy bags. Those are all priced individually. 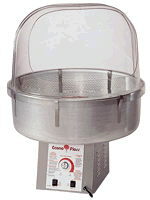 * Please call us with any questions about our cotton candy machine silver 1 rentals in Kennewick, WA and Richland, WA.